To convert a value from binary to hexadecimal, we first need to know what a hexadecimal number is. A major numbering system used in digital systems is the hexadecimal system, also named base 16. In this system, the numbers are counted from 0 to 9 and, since in base 16 we need 16 different symbols, decimal numbers 10 through 15 are represented by letters A through F, respectively. 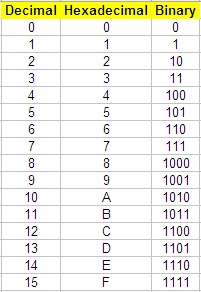 So we go from 0 to F.
The following table shows the meaning of all the symbols in the hex (for short) numbering system. To convert a value from binary to hexadecimal, you merely translate each 4-bit binary group to its hexadecimal equivalent. For example, the binary number 0011 1111 0111 1010 translates into the hex 3F7A equivalent. It’s important to remember that both binary numbers and hexadecimal ones are treated as strings in Matlab. Now, let’s say that we want to explore how the binary groups are separated to form the hex symbols and we want to manipulate our own strings (binary and hexadecimal).